PT Exaro Premieres at NAHAD and NTTC! PT Coupling recently attended two trade shows to showcase a few of our new products. First we attended the NAHAD convention this past April and then the National Tank Trunk Carriers annual conference which started on April 27th. We attended both of these shows with our Z-Core and PT Exaro programs. Presenting immediate information on hose asset status by compiling information through a web-based hose registry, the PT Exaro program will be the future of hose management. We have been working on setting up a webinar for all those interested in learning more about the system. At NAHAD alone, there were about 100 distributors interested in learning more! The webinar will be about 30 minutes and will concentrate on instructing distributors on how to sign up an end user and explaining how the web based PT Exaro program works. Featuring unique serial numbers and a user friendly interface the system will notify you regarding any notifications and provides benefits such as improved safety performance, extended hose service life, increased reliability and more. Additionally, at the NTTC show we featured our new Trailer Mounted Hydraulic Drive Crude System. While we have offered this pump system in the past, this is the first time that it has been available in both trailer and tractor mounted configurations, PTO shaft or hydraulic drive! If you would like to hear more about either of our products, please feel free to email us at info@ptcoupling.com and if you would like to be included in our PT Exaro instructional webinar, please send an email to exaro@ptcoupling.com. We would love to have you join us. Since the inception of PT Coupling, we have held strong to a belief in the highest standards of quality, integrity, and service. We are happy to report that a new tool for working toward these goals is now available for purchase from the NAHAD website: the new Hose Safety Institute Handbook. The Association for Hose and Accessories Distribution (NAHAD) promotes the highest standards of professionalism and integrity within the hose and accessories industry, and its resources support quality, safety and reliability in hose assembly. NAHAD’s newly revised and streamlined Handbook provides a single source for hose assembly safety guidelines (formerly 5 separate sources). 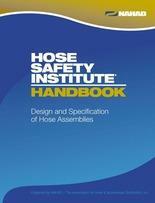 The comprehensive, up-to-date, one-of-a-kind Hose Safety Institute Handbook even includes new tests just released this month, January 2013. PT Coupling is proud to have played a role in the Handbook’s development. Amy Parrish was on the Core Team, reviewing the tests and participating in the pilots; and PT Coupling continues to stay connected and contribute to the organization. We plan to promote NAHAD’s best practices by ensuring that each of our manufacturer reps own a copy of this resource, then we’re even purchasing the tests ourselves so that all of our sales reps will be fully certified. It is vital to our mission to ensure we have the fullest possible understanding of best practices and guidelines in order to deliver the level of quality and safety our customers have come to expect.